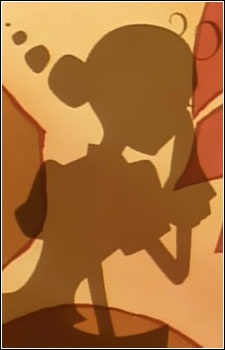 Three girls (known as A-Ko, B-Ko, and C-Ko), seen only in silhouette, who spend about thirty seconds per episode energetically commentating on its events in symbolic allegory. Their antics provide both comic relief and insight into the show's plot. While they function much like a Greek chorus, their primary influence is shadow puppetry. B-ko has her hair in two funny pigtails.